Vineyard work can be dangerous. In fact it can be deadly. Every year around harvest time we hear about accidents either in the vineyard or winery. Some of them are freak accidents. Many of them are preventable. Some of them are health related. But what happens when the vineyard or winery employee has no healthcare? What happens if they are a seasonal worker and unaware of any resources available to them? If you’re in the Willamette Valley of Oregon you’re lucky. You have ¡Salud! Celebrating its 25th anniversary this year, it’s easiest to describe ¡Salud! as a mobile health clinic, but in fact this one-of-a-kind organization is so much more. Maria McCandless, the organizations’ foundation manager, explained that prior to 1991, “People were showing up to the emergency room for little things, things that didn’t need to be seen in an emergency room. The workers didn’t understand that’s not the appropriate way to receive care.” The majority of these employees are seasonal workers and do not qualify for healthcare. Because of this they were not being treated for minor issues, and were unaware of what resources were available to them when it came to larger issues. 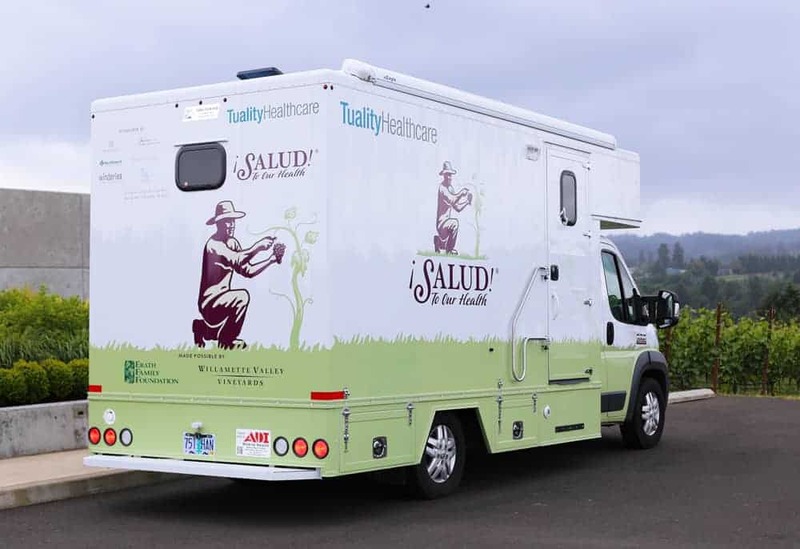 It was that year that a group of winery owners partnered up with physicians from Tuality Healthcare to begin assisting workers with both education, and also basic health care. 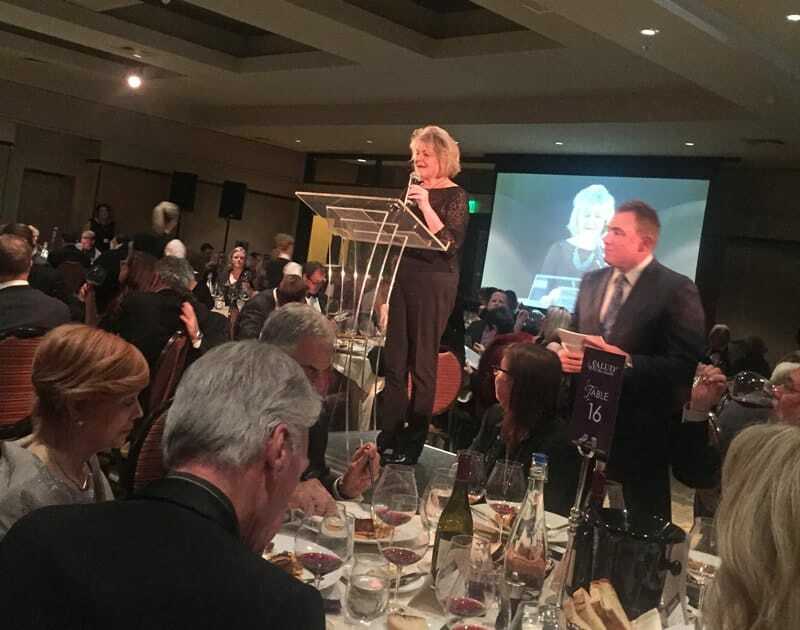 The idea was to create an event with the goal of raising awareness and funds to provide services addressing the healthcare needs of seasonal vineyard workers and their families. Thus the wine auction was born. In its first year, in 1992, the auction raised $127,000. Last year’s two-day auction raised a record-breaking $800,000. Since 1992, ¡Salud! has raised over $11.6 million to provide healthcare to Oregon’s seasonal vineyard workers and their families. And in 2015, 3,873 workers and their families were registered in the ¡Salud! Services program, and over 5,000 medical encounters were documented. That’s a complicated question. One of the focuses of ¡Salud! is on prevention and education. They achieve this via their mobile clinic. 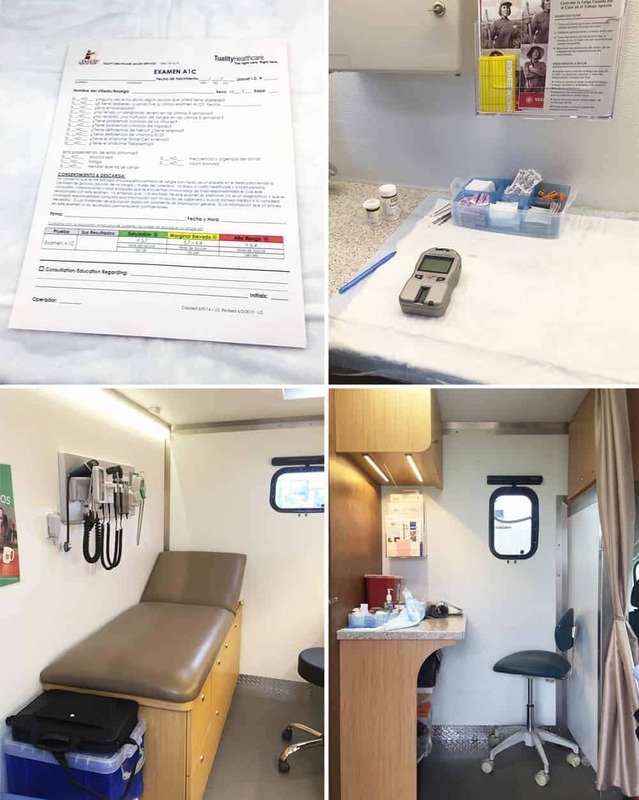 Inside this van, or “Wellness Clinic”, patients can receive a wide range of basic health care services, including: cholesterol, diabetes and vision screenings, blood pressure checks, flu and tetanus vaccinations, and occupational health, nutrition and mental health information. Right on site the tests results are explained to patients and referrals are arranged if further care is needed. They also have a separate clinic that provides dental services. 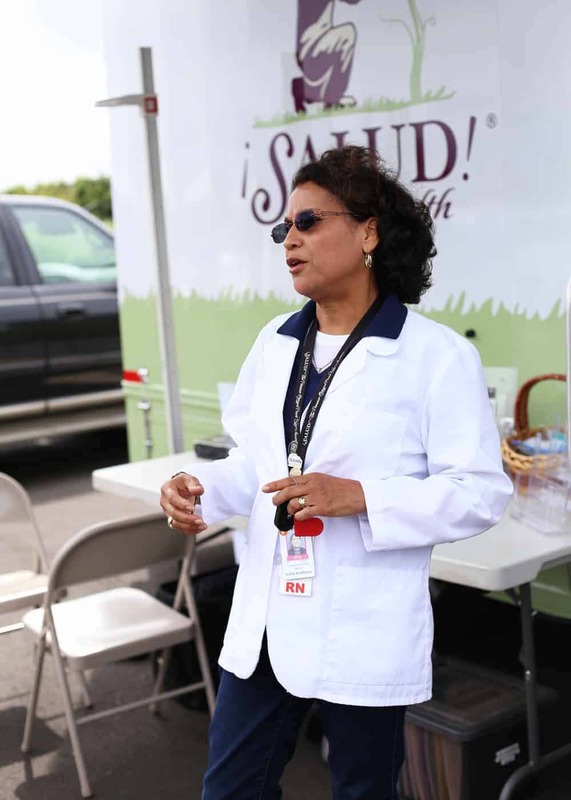 In 1997, due to the growth of the program Leda Garside, RN, BSN, MBA was hired on as outreach coordinator and services manager to become the liaison between vineyard workers, agencies, and doctors, to assist in their health care needs. Many consider Garside the heart and soul of the program. Garside explained that through these wellness clinics, “If we see someone that we’ve discovered a health related issue that warrants a referral then we do so.” And they will work to find an appropriate health care provider to work with the patient. The clinics are announced in advance and instead of workers taking time off work to seek out the clinic, the clinic comes to them. Many times onsite at the winery. Up until recently ¡Salud! contracted with another health care organization to use their mobile unit and had to plan months in advance to create the clinic schedule. But in 2014, ¡Salud! 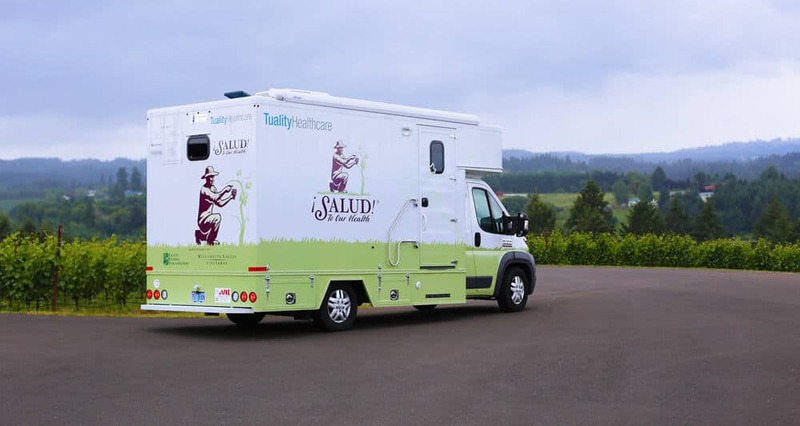 was able to fund the purchase of its own mobile medical unit, eliminating the need to contract with outside vendors for mobile medical services and thus providing better schedule flexibility. This means they can now take it out on a moments notice, which is a huge step forward for the organization. ¡Salud! still subcontracts with Medical Teams International and Pacific University dental clinics to provide the dental services. Even though the organization has made many strides in the right direction over the last 25 years, there are still several challenges. McCandless continued, “We’re limited by time and resources on the funding side. We are kind of close, but yet we’re kind of far away. We’re close in what we believe in and what we want, and we have people that can help us, but the limitations are still there.” She further explained that, “We need to be able to afford those people on a sustainable long term basis. We can go out and get funding for someone for one year, but that’s not going to make a difference down the road. To say ¡Salud! is just a mobile clinic is a complete understatement. This organization is a necessary part of the Willamette Valley community, and as it continues to grow it will continue to need funding. 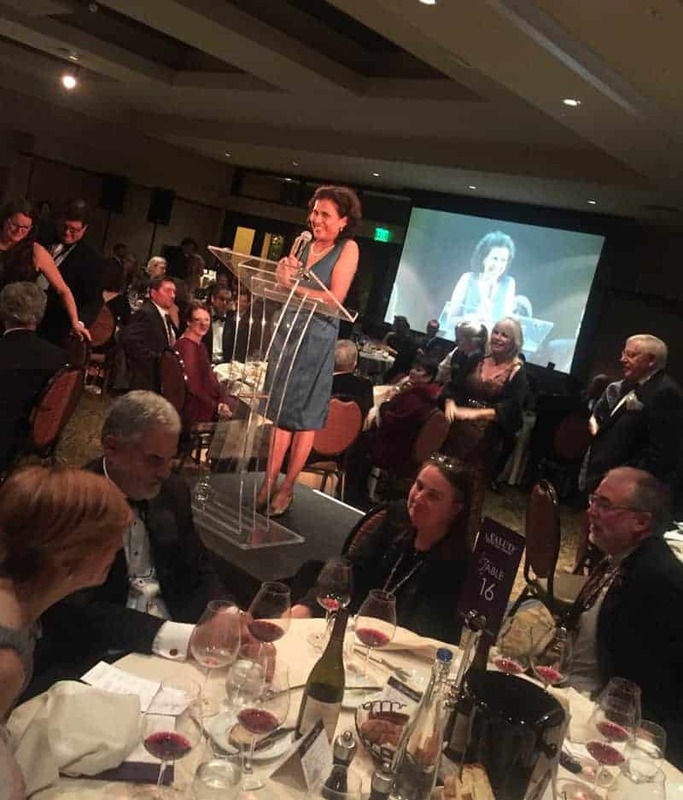 Nancy Ponzi, one of the founding members of ¡Salud!, speaking at the 2015 auction. The biggest fundraising event of the year is coming up soon with the ¡Salud! Cuvée Tasting and Big Board Auction and 25th Anniversary Celebration Gala and Auction. ¡Salud! Cuvée Pinot Noirs are exclusive to the ¡Salud! auction — only five cases from each winery are sold at the event, and aren’t available in stores, restaurants, or tasting rooms. You can purchase tickets to either of these incredible events online. If you can’t make it to these events, you can still contribute. “A direct monetary contribution to ¡Salud! is the most effective way to aid us in our mission to provide healthcare outreach and education to Oregon’s seasonal vineyard workers and their families. Please visit our website to make a secure donation and see how our collaborative relationships with partner provider organizations allow us to use your generous contributions as effectively and efficiently as possible.” Click here to contibute. 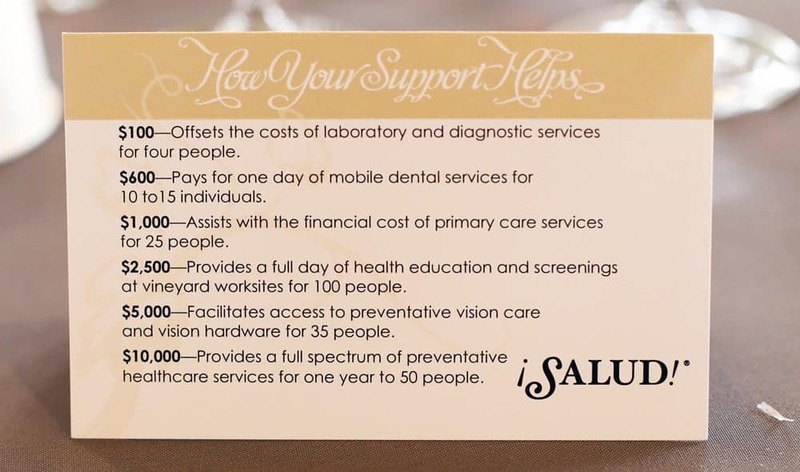 How your support helps ¡Salud! A very special thank you to Maria McCandless and Leda Garside for taking the time to speak with me about this incredible organization, and for also inviting me to come out and learn more about the mobile clinic. You are amazing and I am in awe of the work you do! It warms my heart too, Katy! Such incredible work they do. What a great organization and service – Thanks for this informative write up! Wow. 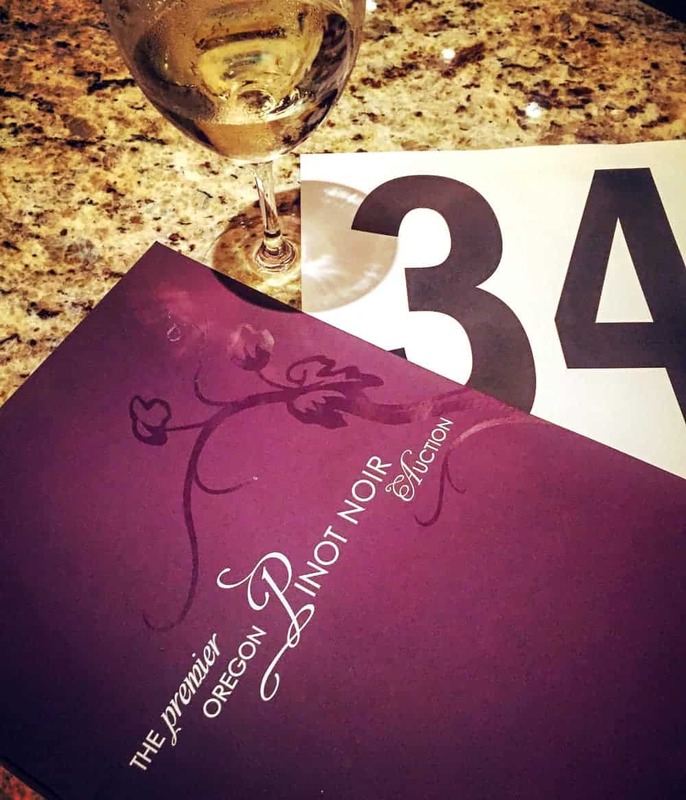 I haven’t considered this issue before—so much of what happens to make Oregon’s wonderful wines is hidden from us wine drinkers. Thank you very much for sharing this post, and especially to everyone who runs Salud! It’s such incredible and important work that they do! !